Yet Khlebnikov does not fit into any one school or trend. His work explores a unique broad terrain. He was among the great innovators of literary modernism. He blurred the distinction between verse and prose. He made use of patterns from folklore and chants, incantations and shamanistic language. In addition to poems and plays, stories and essays, he wrote political and artistic manifestos, essays on history, architecture, and social problems, literary theory, and journalistic pieces on current events. His passion for internationalism in politics and the arts prompted him to envisage a world-wide brotherhood of creative scientists, writers, and thinkers dedicated to understanding nature and to counteracting all the social evils fostered by political leaders. Khlebnikov’s metaphysics are largely Taoist, more likely a rediscovery of the workings of yin and yang than a conscious influence of Chinese philosophy although he had a wide knowledge of Slavic and Indian mythology and a general interest in Asia. Death came too soon. 1913 had been a high point of cooperation among the Cubo-Futurists when they staged the opera “Victory over the Sun”. 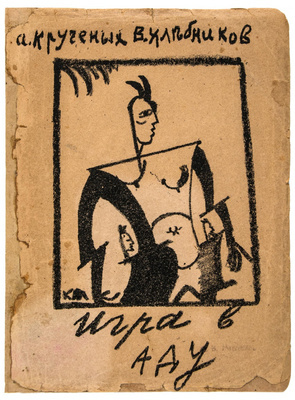 The music was by Mikhail Matiushin (1861 -1934) with the sets and costumes by Kazimir Malevich and the prologue by Khlebnikov. War, revolution, civil war and exile broke up these creative groups. Although they were unable to create the future they had envisaged, the ideas are powerful beacons and can still reach a wider audience. To unite mankind into harmony with the universe is still central to the world citizens goals. See: Raymond Cooke. Velimir Khlebnikov (Cambridge: Cambridge University Press, 1987) and Paul Schmidt’s translations The King of Time (1985) and Collected Works (1987 and 1989) both published by Harvard University Press.